Paper Craft Crew Tic Tac Toe Challenge! It’s easy to play along – just choose any 1 row – either diagonal, vertical or horizontal, and include those 3 features in your project. The colour and layout is up to you. Then link up as usual! I thought that the retired Birthday Bouquet Designer Series Paper fit this just perfectly, as I was able to pair it with Mint Macaron and Blushing Bride cardstock and ink – you can’t get too much more ‘pastel’ than these colours! I started with a card base of Blushing Bride, then added the panel of Birthday Bouquet DSP; it has these cute little polka dots in Blushing Bride, Mint Macaron and Basic Black against the nice neutral Whisper White. I then added a panel of Mint Macaron cardstock down the left hand side. 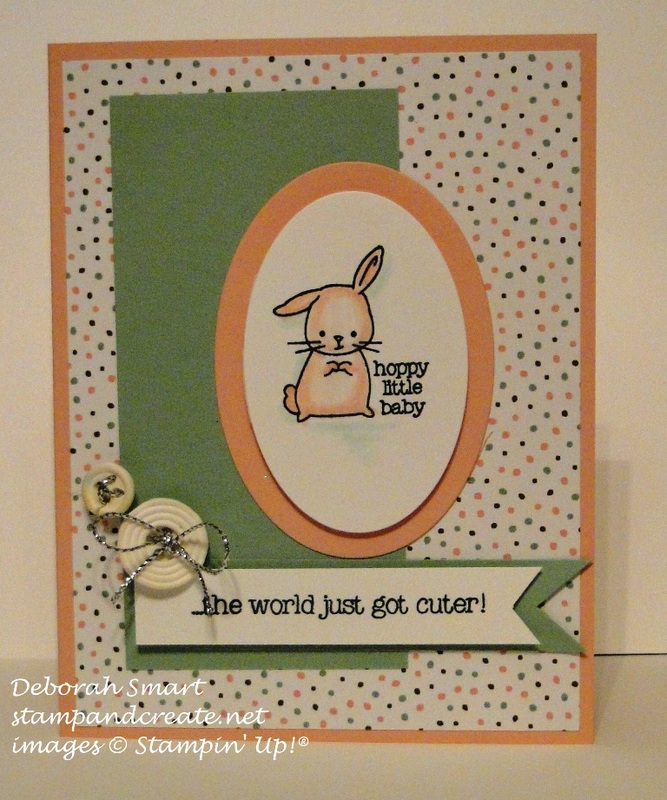 I stamped the little bunny from the Made with Love stamp set onto Whisper White cardstock in Memento black ink, then used my Blender Pen and Blushing Bride ink pad to colour in the bunny. I wanted him to look like a soft stuffed animal 🙂 After colouring the bunny, I used the Blender Pen and Soft Sky ink to add some shadow around and under the bunny. I then used the Ovals Framelits to die cut this piece, plus another oval 1 size larger from Blushing Bride cardstock, then layered them together with Stampin’ Dimensionals, then glued them (using Tombow liquid glue) to the card front. The sentiment is also from the Made with Love set, stamped in Memento Black onto a piece of Whisper White cardstock, the layered with a piece of Mint Macaron, and attached under the stamped image. Do you recognize those buttons?? Talk about a blast from the past – these were made from the modeling clay and molds that SU! carried a few years ago! I tied some Silver Cording through the buttons, then attached them to the card front using Glue Dots. I really wish we had carried this clay for longer, and with more molds. They’re so light, they don’t add any weight to your card! I hope you’ll join us for this fun challenge! Before you do, please check out the rest of the Design Team’s cards on the Paper Craft Crew blog – they’re awesome, and you’ll get lots of inspiration! Next Next post: SUDSOL Blog Hop!